The Administrator role is used to configure the system and has its own secure “Settings” page. It can track information on all employees who are logged into Skypetime. On the main page, which is accessible to the Administrator, there are 4 information tables (panels) displaying: Latecomers, Absent, Worktime of all department employees for the past day and Leaves Requested for the current week, Reports and Directories. The date of the displayed data in the info tables can be changed by clicking on the calendar icon in the upper right corner or in the drop-down list (as in the “Leaves Requested” table). The Administrator is accessible to the Dashboard, in which the information is shown only by his profile. 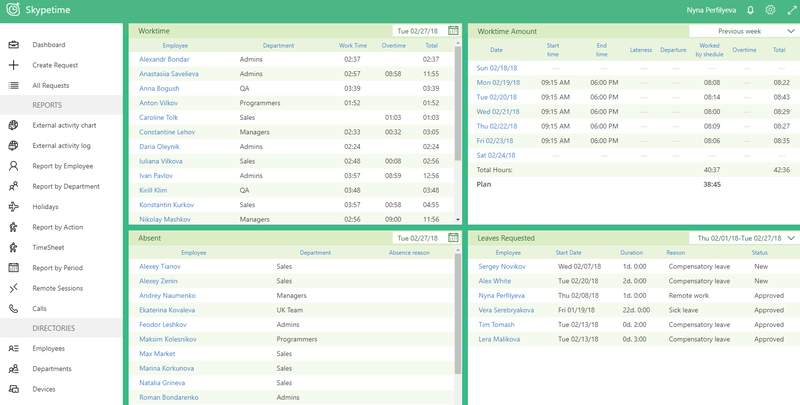 From the tables “Latecomers”, “Work time” and “Absent” by clicking on the employee’s name, the transition to the “Report by Employee” is performed. From the “Leaves Requested” table, you will be taken to the query details page.